RUBY C. HAYES, of Green Forest, Arkansas, was born September 14, 1926 in Clarksville, Texas to Thomas and Ida May (Ryno) Gordineer. 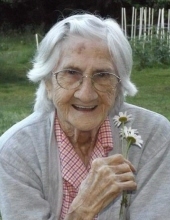 She departed this life February 2, 2019 in Green Forest at the age of 92. She is survived by three children, William Allen Hayes, Johnny Hayes and his wife, Janet and Joy Hartlage and her husband, Richard; numerous grandchildren, great-grandchildren and great-great-grandchildren; several nieces, nephews, other relatives and loved ones. She was preceded in death by her parents, Thomas and Ida Gordineer; husband, Marvin Walter Hayes; one son, one daughter and several brothers and sisters. To send flowers or a remembrance gift to the family of Ruby C. Hayes, please visit our Tribute Store. "Email Address" would like to share the life celebration of Ruby C. Hayes. Click on the "link" to go to share a favorite memory or leave a condolence message for the family.